What does that non-existing but evocative word mean, and how does it define this exhibition? In their brief for the exhibition for the beautiful MUAC (Museo Universitario de Arte Contemporáneo) in México, helde from January 28 to July 22, the curators, Néstor García Canclini and Andréa Giunta, define “extranjerías” as the transition for the “proper” or “own” (the Spanish word “propio” is nicely ambiguous). The exhibition forms a cleverly designed area of ambiguity and enigmatic, personal imaginings of what the word means for each artist. My three films, Becoming Vera, Colony, and Elena, focus on the ambiguities of migratory situations: multiple identities, labour relations in the past, and the loss of the mothers of migrants respectively. Elena is one video from the project Nothing is Missing. These were the only works touching on the subject of migratory culture as an area of estrangerías. Thus, they put a gloss on the other works, which were all more enigmatic related to the title theme. 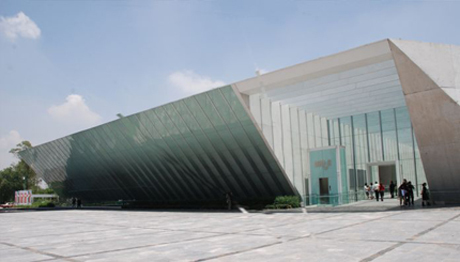 The spectacular building of the new MUAC emphasizes the “strangeness”. I am very happy with the way my works are installed. One of four galleries had been divided in three sections with open pass ways between them. This gives a lovely permeability while the sound is isolated for each, and there is no light interference. The exhibition is attracting many visitors. The opening weekend, 9000 came. Many visitors are young people, families, not the elitist public so often predominant.